There have been a few mobile apps to hit the market in the past couple of years that let consumers sell their pre-loved luxury goods online, but nothing quite like this new app lets consumers reach very wealthy shoppers. I’m talking about jewelry that costs well over the $30,000 USD mark, as finding a platform to sell this kind of jewelry online is very difficult to do – until now, that is. 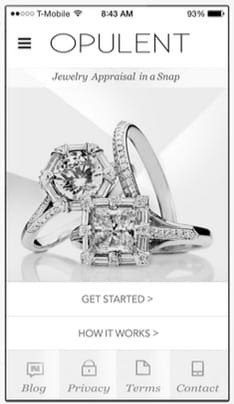 AppSnap by Opulent Jewelers is a free iPhone/iPad (Android coming soon) application that gets you a professional appraisal on your jewelry, as well as gives you the opportunity to sell it on their platform. However, not everyone will be able to sell on AppSnap as each piece will have to meet the guidelines to be approved for sale. Selling to UHNW individuals and even affluent millennials online is no easy task, so this kind of platform is interesting and exciting to see in action from a marketing perspective. Selling an item that costs more than $30,000 USD online requires a lot of trust in the vendor and building that takes a lot of time. With one of the largest wealth transfers in history on the horizon, there is going to be a lot of jewelry passed down that is quickly going to hit the auction block for cash and trade-ins. Affluent individuals also love to sell estate and rare pieces once they’ve reached a certain price point, and Opulent Jewelers is known for having the rare and haute pieces. This is what really makes AppSnap stand out, because there are too few places you can really offload an ultra high-end piece of jewelry online. The app itself is quite simple, which really is nice because I want to get right to the selling. All that’s needed is a description of the item along with a set of pictures which you can add within the app. From there, the team at Opulent Jewelers will obviously make sure it’s 100% authentic, and subsequently appraise your item, at which point – if it passes the quality test – you’re given the option to have them try and sell it on your behalf. You will have to send the jewelry piece to them in their Pennsylvania showroom, where it is kept very secure and they even polish and clean your jewelry before listing it on their marketplace. If you’d like to try out AppSnap or talk to Opulent Jewelers about their platform and selling abilities, I highly recommend you send them an email and tell them I sent you. Their CEO Jon always makes himself available to potential clients, and you can call him at 1-800-471-4129 or send him a shout through social media.